Harvest update. Getting a few more cherries coming along. Both the Sungold and the White Currant are leading the pack (note, the links are to the sources of the seeds I grew these plants from). 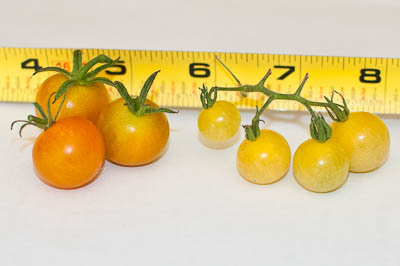 The Sungold’s are great, good size cherry tomatoes. Nice orange color. The White Currants are more yellow, are also tasty, but are quite a bit smaller. 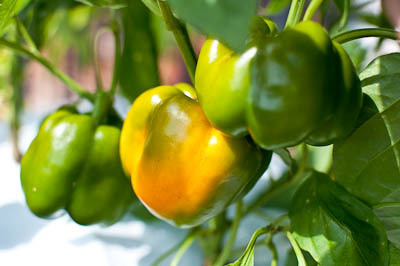 The Orange Bell is finally ripening. Should be pickable in a few days. Some of the jalapenos are forming with chocolate brown streaks along the length of the pepper. Looks pretty cool. 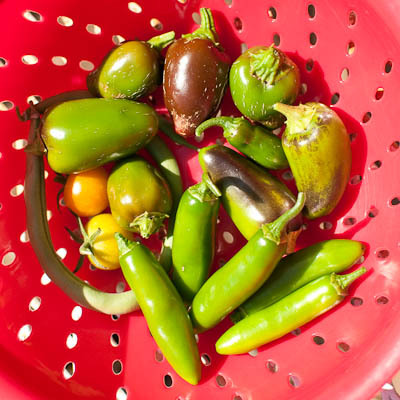 Harvested several jalapenos and serranos.